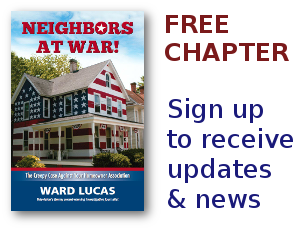 On Stopping Bullies - Neighbors at War! “If angels were to govern men, neither external nor internal controls on government would be necessary.” James Madison, The Federalist papers, # 51. “CIDS [HOAs] currently engage in many activities that would be prohibited if they were viewed by the courts as the equivalent of local governments.” … Privatopia, Evan McKenzie(1964). Much of HOA legislation does not contain external enforcement provisions, such as an outright “null and void” statement, but rely on the goodwill of upstanding citizens and officers of the court to do what is right as intended by the reform legislation. Well, we know that that is a vast delusion. We see HOA attorneys seeking loopholes in statutes, bring up vague and unsupportable questions of law, etc. to intimidate homeowners into not taking action or else pay through the nose. All those words and clauses that the attorneys seem to find vague and unclear and seek civil action to clarify their meanings. No, stop the bullying by imposing civil penalties on those who do not serve good public policy to make better communities, rather than to stuff their pockets. Like special taxing districts, civil penalties abound in the laws of all states. I prefer misdemeanor charges to make the message clear. One of the finest passages George O. ever wrote. George Staropoli is a noble man fighting the beast of HOA dictatorial government. Most board members are far from angels – more like most are really devils. I like his concept of creating more laws to govern over the board of directors to actually be able to take them to court and create misdemeanor charges against them. Only problem with that idea is that these devils then stick the HOA with the cost of the fines and have D & O insurance to cover their legal costs. The Insurance carriers need to start getting wise about all the fraud and corruption they are defending. We live in an age of “faux regulation,” written and sponsored by politicians who are out of touch with the real world, whose Bills are either killed or watered down and altered to the point of absurdity, voted on by other politicians who have never read the small print nor considered the unintended consequences of making bad policy the law of the land.